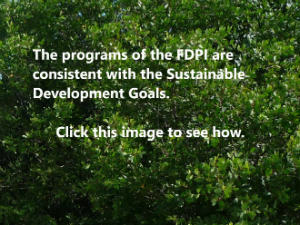 Foundation for Development Planning Inc.
Civil Society Network of the Global Environment Facility (GEF-CSO Network). Regional Public Mechanism of the Regional Agreement on Access to Information, Public Participation and Access to Justice in Environmental Matters (Principle 10) in Latin America and the Caribbean. The Representatives of the Public also provide information on the role and contributions of civil society to the regional process. The First International Conference on the Sustainable Development of Small Island Developing States (SIDS) was convened by the United Nations in 1994 in Barbados. The conference adopted the Barbados Programme of Action, which focused on priority environment and development issues in SIDS. In January 2005, the United Nations convened the Second International Conference on the Sustainable Development of Small Island Developing States in Mauritius to review the status of implementation of the Barbados Programme of Action. The conference produced the Mauritius Strategy for the Further Implementation of the Programme of Action for the Sustainable Development of Small Island Developing States. The University Consortium for Small Island States was also launched at the Mauritius conference. The Third International Conference on Small Island Developing States was held September 1-4, 2014 in Apia, Samoa. The conference produced the SIDS Accelerated Modalities of Action (SAMOA) Pathway, which was subsequently adopted by the United Nations General Assembly in November 2014. The SIDS Action Platform was developed to support implementation of the SAMOA Pathway. Coordination of the SIDS Programme in the Caribbean is shared by the Economic Commission for Latin America and the Caribbean (ECLAC) and the Caribbean Community (CARICOM) Secretariat. The Caribbean Environment Programme (CEP) is one of the Regional Seas Programmes of the United Nations Environment Programme. The CEP was designed to meet the environmental challenges in the Wider Caribbean Region as identified in the1981 Caribbean Action Plan. The Action Plan led to the 1983 adoption of the Convention for the Protection and Development of the Marine Environment of the Wider Caribbean Region (Cartagena Convention), which provides the legal framework for the CEP. The Caribbean Regional Coordinating Unit, located in Jamaica, was created in 1986 to serve as the Secretariat to the Caribbean Environment Programme. The Global Water Partnership-Caribbean is a working partnership among institutions involved in water management within the Caribbean region. The Mission of the GWP-C is to support Caribbean countries in the sustainable management of their water resources, through the establishment of strategic alliances. GWP-C is fully committed to promoting and applying the concept of an Integrated Water Resources Management approach at the community, national, and regional levels. A number of thematic programs are managed by regional organizations, either established under multilateral agreements or established as part of the Caribbean inter-governmental mechanism. A large number of Caribbean regional civil society organizations participate in regional environment and development programs. The role of civil society organizations in the development process is well recognized, and such a role is specifically identified in a number of global and regional environment and development programs. The roles of inter-governmental and civil society organizations in the regional development process are best demonstrated by the operation of Caribbean professional networks. Discussions are currently taking place within the civil society sector in the U.S. Virgin Islands regarding a proposal to establish an association of nonprofit organizations in the Territory. Civil society organizations that wish to participate in the discussion should contact the Foundation for Development Planning Inc by electronic mail, using the address in the attached Discussion Paper.